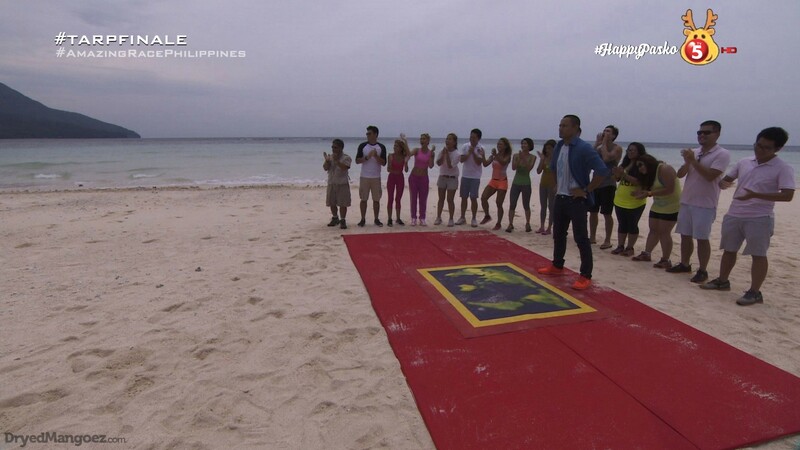 Recap: The Amazing Race Philippines 2, Episode 55 (Leg 10 – Season Finale) – "Sobrang hindi namin 'to makakalimutan." 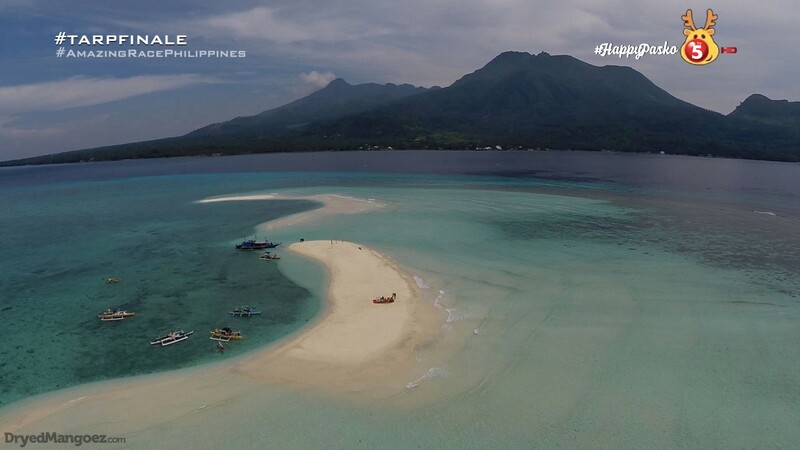 The final Leg begins with teams needing to catch a ferry to the island of Camiguin. Once there, they’ll hop into a multicab to Kibila Giant Clam Sanctuary. All three teams are on the same 7am ferry and are neck and neck going to the Clam Sanctuary. 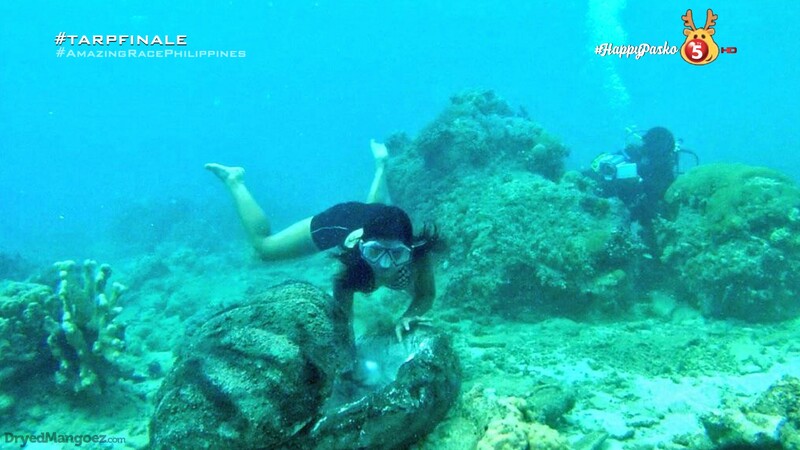 For this task, teams must swim out to a marked buoy where they will dive down 10 feet to find a white pearl in a giant clam which they can exchange for their next clue. Eji is not comfortable with deep water so he, Kelvin and JP ask for some lifevests. Phoebe has trouble with her snorkeling gear, so she just lets Matt retrieve the pearl which is in a clam right where Kelvin & JP were. Matt & Phoebe return to the shore and receive the next clue. They must now make their way to Tuasan Falls where they will rappel down the waterfall while collecting puzzle pieces. The completed puzzle will reveal their next Route Marker. 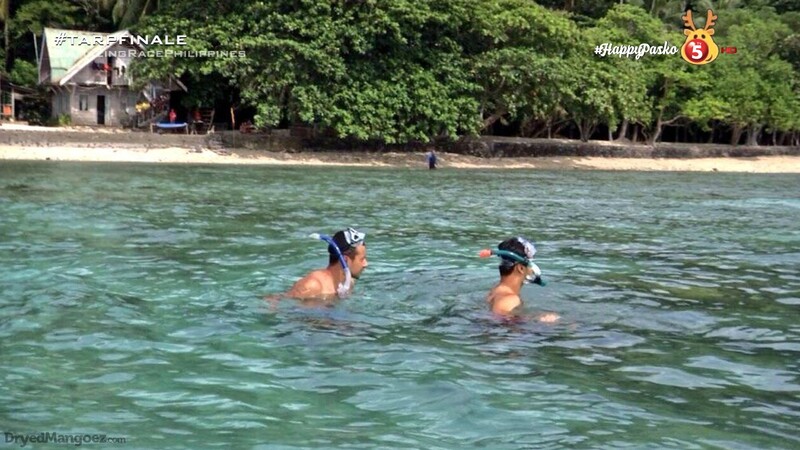 JP swims down to grab the pearl and he and Kelvin swim to shore. But Roch & Eji are having a little trouble. Roch finally grabs the pearl, but drops it and has to swim back down again. Kelvin & JP catch up to Matt & Phoebe at the Falls. Matt decides to collect the puzzle pieces and Phoebe will place them in her bag. They collect all the pieces and must now place them into a board. 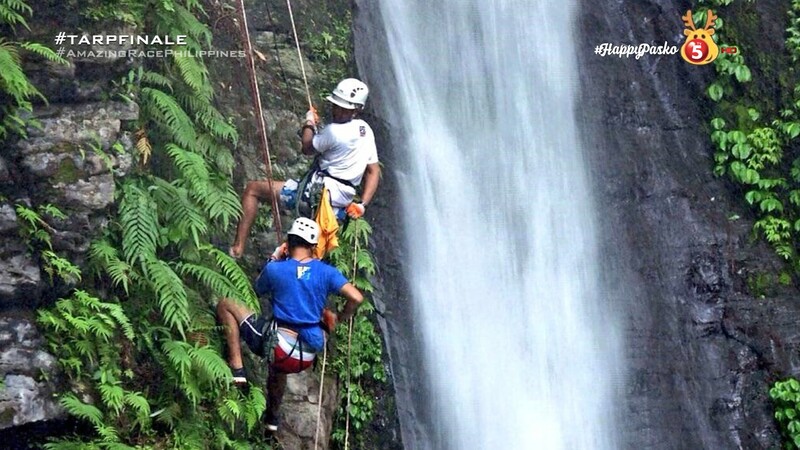 Kelvin & JP are starting down the waterfall. Kelvin will collect the puzzle pieces and hand them to JP. On the last basket, JP swings Kelvin over to reach it. Roch & Eji arrive and get started down the waterfall as Matt & Phoebe finish the puzzle. The get the next clue pointing them to the Sunken Cemetery. Roch collects the puzzle pieces while Eji holds the bag. They are not giving up hope yet even if they are in last. Kelvin & JP and Roch & Eji hurry to try and catch up. Matt & Phoebe arrive at the Sunken Cemetery where they find the Road Block. For this Road Block, teams will travel by boat to the Sunken Cemetery where they will be given 2 minutes to memorize eight Alibata symbols. They will then make their way on foot to the old church ruins and arrange the symbols in the correct order using an old column. If correct, the monk will hand them the next clue. Phoebe decides to do the Road Block. She gets to the Sunken Cemetery and tries to come up with a story to try and remember the symbols. Phoebe heads back to shore as JP makes his way to the monument where he decides to make a word out of what letters the symbols look like. As Phoebe and JP run to the church, Eji decides to do the Road Block and comes up with a name to remember the symbols. 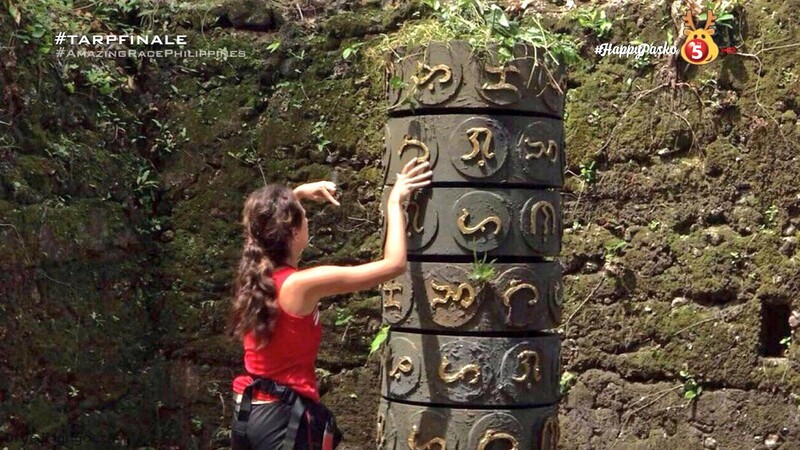 Phoebe arrives at the church and finds the columns. She starts spinning the layers as JP arrives and begins. Eji arrives at the columns as well. Phoebe asks the monk to check. He quickly approves her. JP asks for inspection. He also gets it correct. Eji asks for approval and he gets the next clue. All three of them are running back to their partners. 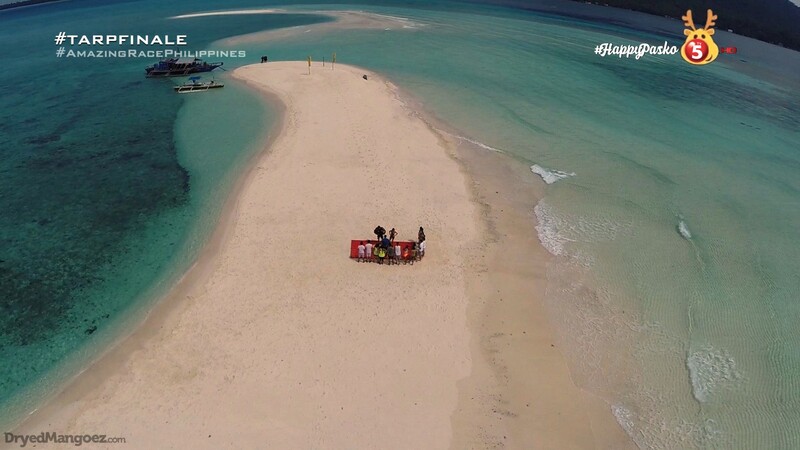 Matt & Phoebe open the next clue telling them to ride a fishing boat to Mantigue Island where they will search a beach of clueboxes for the correct clue revealing the location of the Finish Line. 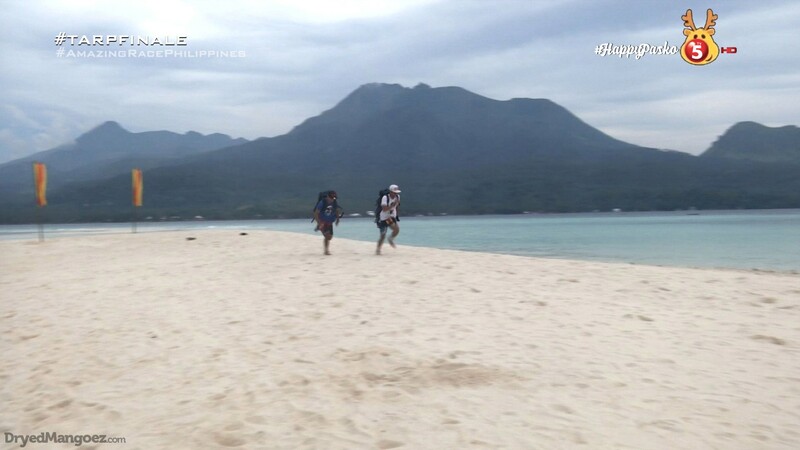 All three teams arrive at the Rexona flagged Mantigue Island and begin searching the clueboxes. 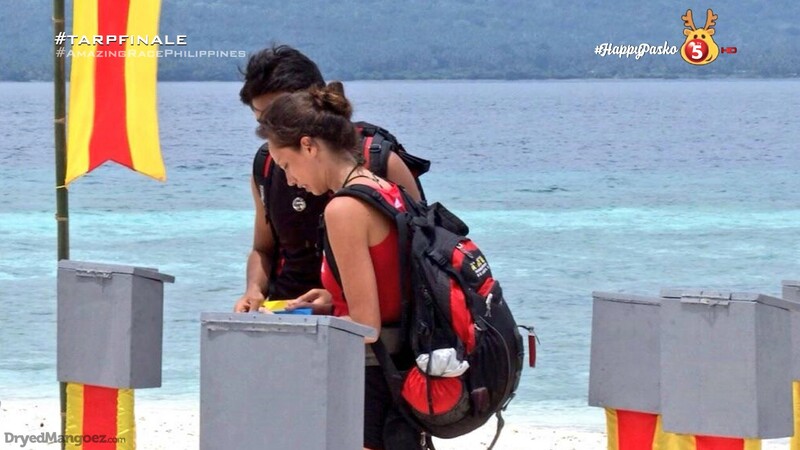 Matt & Phoebe find the correct clue first pointing them to Barangay Yumbing where they will hop on a fishing boat taking them to the Finish Line on White Beach Island. Kelvin & JP find the clue next with Roch & Eji still in 3rd. All three teams are on the final boat ride to the Finish Line where Derek and the other eight teams (minus Chen) are excitedly waiting. But maintaining their lead, Matt & Phoebe run along the beach and step on the Mat first. Derek officially checks them in as Team #1 and declares them winners of 2 Kia Sportages, 2 RCD Royale Homes house and lots and P2 million from PLDT Home Telpad. They want to save and invest some money as well as donate to help children in Payatas. Kelvin & JP come running onto the Mat, but Derek tells them to get off. Something’s missing. Kelvin & JP step back and jump onto the Mat. Derek officially checks them in as Team #2. Roch & Eji arrive and happily shriek their way to the Mat. They are very proud to never have had Derek eliminate them. Derek loves their positivity and happiness on the Race. He officially checks them in as Team #3. Eji talks about being afraid of mentioning he is a Leukemia survivor when auditioning for fear of not being accepted because of it. But he is very happy, especially for his mom to know they are Top 3. 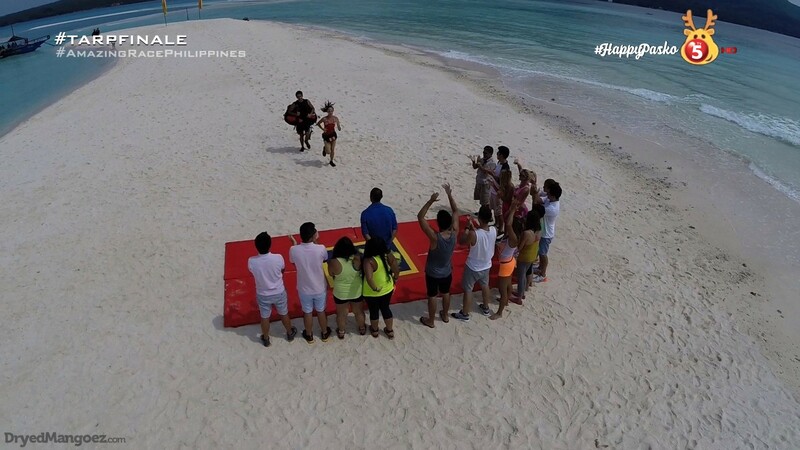 The teams all have a group hug and cheer for Season 2 of The Amazing Race Philippines. Is it too harsh to say this may have been the worst Final Leg I’ve ever seen? I am really shocked by how simple and bare this Final Leg was, especially after a season that made such a point to have longer Legs. That is really shocking. I don’t know what went into the decision to design a Leg like this. I don’t think it was to avoid it from being a Linear Leg because it still was, considering I don’t think any of the teams ever saw each other since leaving the pearl task. And they actually still kept one Route Marker per segment. lol I was looking forward to seeing the episode edited like a normal one-hour TAR episode, but I don’t know if that was even possible considering the design of the Leg. Now the tasks themselves were fine on their own. I really liked the Alibata task at the Sunken Cemetery. But I think there should have at least been another Road Block. This Leg was just really basic and not a Final Leg-level design at all. I am very surprised and disappointed. No markets or farms or something resort-y even? That said, this Final 3 is definitely much better than season 1’s which I still think may be the worst TAR final 3 ever. Just no one to root for in season 1 whereas here in season 2, I didn’t really mind if any of them won. Hilariously unacceptable! Why did they even take a picture without Roch & Eji and Kelvin & JP in the first place? And then why would they include it in the preseason trailer when it is obvious based on their clothes the teams are wearing which one was in the final. That was just strange. Anyway. It was a fine win for Matt & Phoebe. But it was a horrible Leg. These three teams deserved a much fuller and more exciting finale. ← Recap: Kamen Rider Drive, Episode 7 – How Was That Decisive Moment Captured? 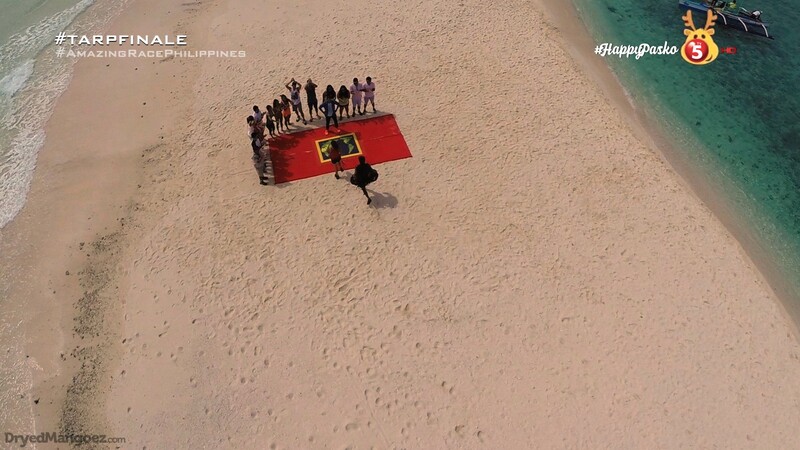 I agree… sobrang simple ng finale.. i expected a harder challenges… hindi ganun kaexciting.. but congrats to matt and phoebe,, deserve nila manalo… agree din ako sa mas exciting sila panoodin kesa dun sa season 1 pero mas deserve nila ang mhirap na challenges.. haysss. looking forward sa mas better na season.